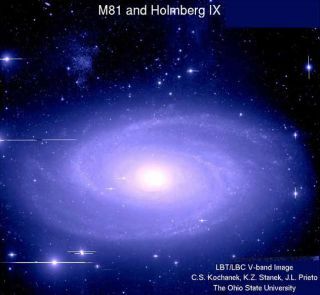 Ohio State University astronomers are using the Large Binocular Telescope to look for ultra long period cepheid stars in galaxies such as M81 (shown here). Image courtesy of Ohio State University. A newmethod for measuring cosmic distances could pinpoint objects in the universe upto 300 million light-years away and beyond. Thejust-realized technique was announced today at a meeting of the AmericanAstronomical Union in Pasadena, Calif., and could help astronomers in theirquest to track the universe's expansion rate. Until now,astronomers have partly relied on giant stars called short-period cepheids thatbrighten and dim every few days to calculate distances to objects in theuniverse. This lightblinking directly relates to the star's true brightness, and astronomerscan compare the true and apparent luminosity (as seen from Earth) to determinethe distanceto that object. But beyond 100 million light-years from Earth, the stars'signals get lost among other bright stars. The newmethod involves so-called ultra long period cepheids (ULP cepheids), which aremuch brighter and so stand out at even farther distances. KrzysztofStanek of Ohio State University and his colleagues searched the literature,finding records for 18 such ULP cepheids, ranging from 12 to 20 times the massof the sun and located in nearby galaxies. The distances to these nearbygalaxies are well known, so the astronomers used that knowledge to calibratethe distance to the ULP cepheids. They foundthat they could use ULP cepheids to determine distance with a 10 to 20 percenterror, a rate typical of other methods used for measuring cosmic distances. Theresearchers hope to reduce that error as more ULP cepheids are recorded. Now, theresearchers are using the Large Binocular Telescope in Tucson, Ariz., to look for more ULP cepheids. Stanek said they've found a few good candidates inthe galaxy M81, but those results have yet to be confirmed. The research was funded by the NationalScience Foundation.